I just finished a book I was reading as part of my research for my next book. It has taken me four months to finish it. Non-fiction works that way with me. It was fascinating, small print, footnotes – not my usual fare. But it gave me background that I need. 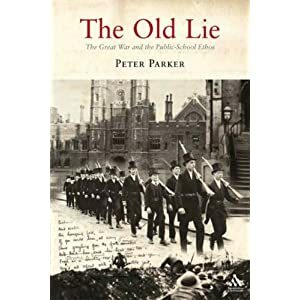 It’s title is The Old Lie, The Great War and the Public School Ethos, by Peter Parker. I bought a used copy since it’s out of print. I’ve got notes written in the margins now, pages dog-eared, flags sticking out its side, and a coffee/tea stain here and there on the cover (or that may have come with the book). This is what drove English boys to war from the public schools at ages of 17 and 18, to be officers. It’s still doing its work today. The thing is in 1914 England the world was very different from what it is today. Context is everything. This entry was posted on March 28, 2012 by Joe Lunievicz. It was filed under Blog, Historical Fiction, Next Book, words . So this book was written by Spiderman?